everything is twenty dollars or less! Zara Tee $19.90 OMG...okay, so this reminds me a wee bit of myself, a blonder French version and you all know how obsessed I am with Paris, is it wrong to actually wear this out or will I look le crazy? Jury is still out. Bracelet Watch $20 Nordstrom sells this watch all year, but this newer rose gold (this isn't as "rose" as the previous one) is even better than before and has the look of an expensive watch without the price tag. H&M Dress $14.95 I showed this dress on my instagram account last week and everyone loved it, they finally restocked it online, it's not too short either and just right to wear with tights when it gets cold. Panama Hat $14.80 F21 continues to dominate the affordable accessories world and they just received new shipment of fall hats (after the last group sold out) and no need to wait for a sale with this price. One of H&M's most affordable and stylish collection yet! That clutch is one of my favorite finds of yours!!!!! LOVE. Thank you - I really love to hear that!! 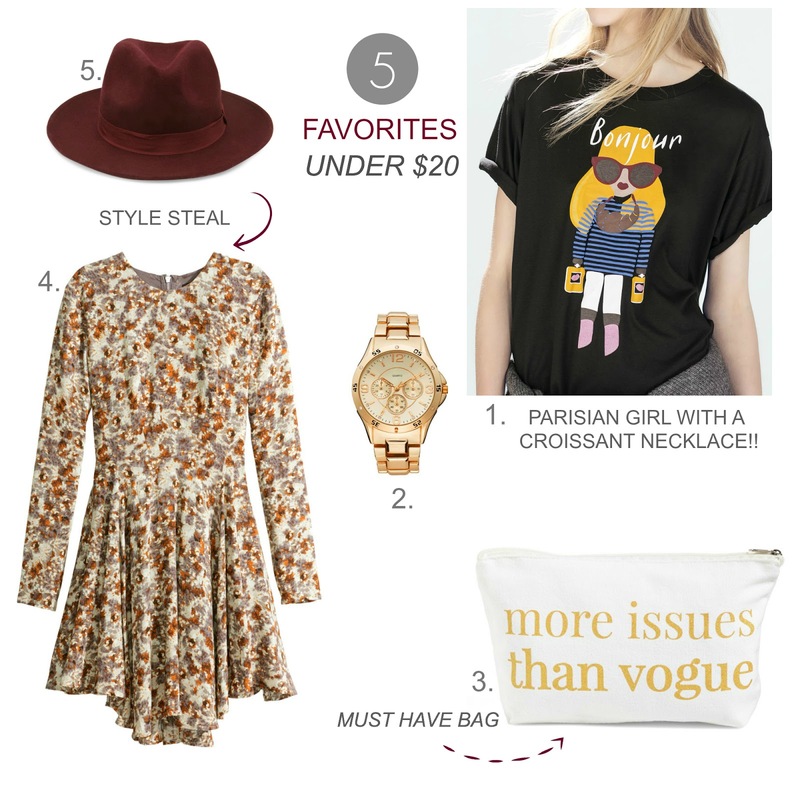 You are SO right about F21 dominating the affordable accessories! That hat was my favorite piece from this set and of course, it's from F21. I've also had SO much luck with their handbags lately! So many cute, super affordable options. Their clothes rarely seem to fit me right but I find myself going in store a lot more lately to peek at the accessoriess...and it's so hard to leave empty handed!